A shared-use path or mixed-use path is a form of infrastructure that supports multiple recreation and transportation opportunities, such as walking, bicycling, inline skating and people in wheelchairs. Motorcycles and mopeds are normally prohibited. A shared-use path typically has a surface that is asphalt, concrete or firmly packed crushed aggregate. Shared-use paths differ from exclusive bikeways in that shared-use paths are designed to include pedestrians even if the primary anticipated users are cyclists. 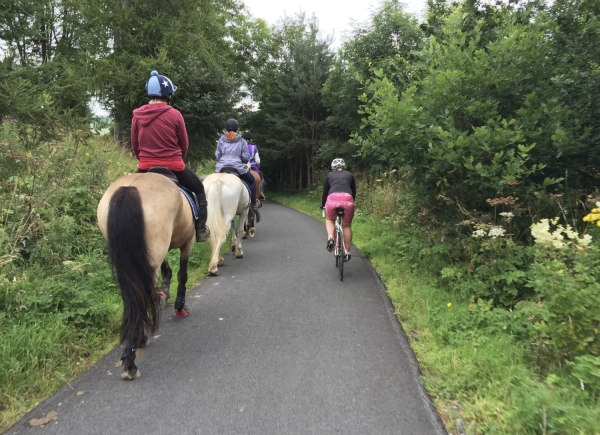 Shared-use paths sometimes provide different lanes for users who travel at different speeds to prevent conflicts between user groups on high-use trails.